My friend Pierre Oliver is building an HO scale layout based on the Wabash Railroad through Southern Ontario (in fact, the Wabash had trackage rights over a portion of the CNR that was used by trains headed to Port Rowan, so trains on his layout and on mine could have met). From the front, the kiln has a small door (only about 5.5 feet high) and two wood stoves built into the foundation at the corners. These vented out a tall chimney on the back. They heated the kiln to cure the leaves, which were hung inside. The hatches on the peaked walls allowed the farmer to inspect the leaves hung higher up in the building and could also be opened for ventilation. Four were swing-out hatches. The front wall also had a sliding panel up at the peak. Each opening was secured with one or more simple latches – consisting of a length of wood with a pivot in the middle. What I didn’t appreciate until I started building this kiln is just how many latches, hinges and other details were required. But they add so much character to the finished model, I think. I’ve given the model a good dose of weathering to represent years of smoke and tobacco juices. More needs to be done but I’ll let Pierre tackle that so he can blend the structures into the others on his layout. This is a very enjoyable project – so far. Ask me again after I’ve done four more in HO… and five in S! This entry was posted in Beyond Port Rowan in S, St Williams tobacco kilns, structures by Trevor. Bookmark the permalink. What an interesting process, very much different than my local tobacco drying (open air barn). 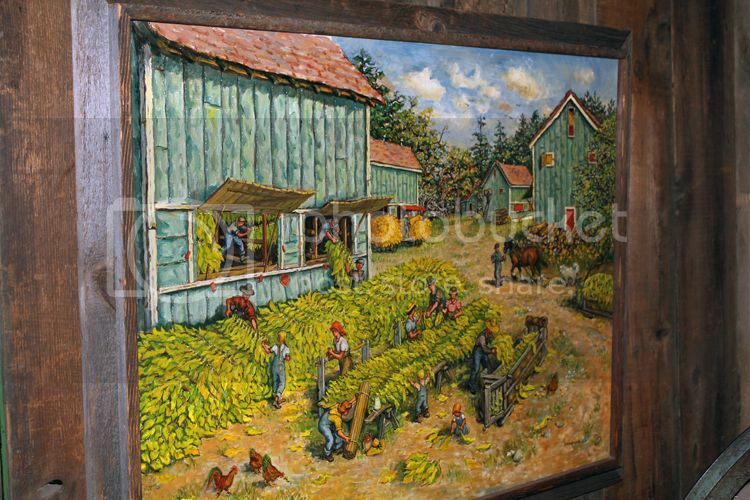 I imagine that the growing season in southern Ontario was shorter and there was no way to air dry the tobacco because colder weather has set in. Where was the kiln dried tobacco shipped? Did the CN transport dried tobacco barrels on Port Rowan branch? Looking good! I also would like to know how the tar paper was done. 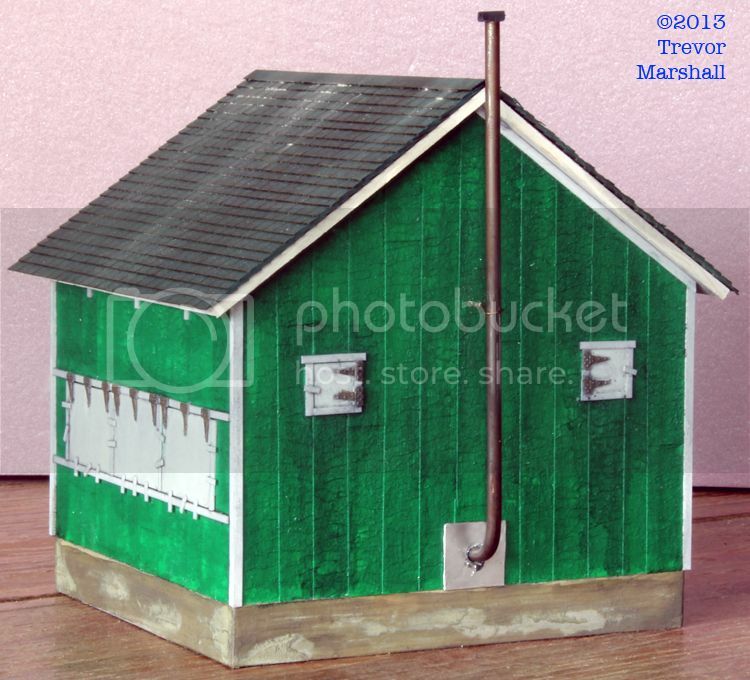 They make very different looking buildings for a model railroad that I’ve seen. Thanks Mike! I’ve answered the tarpaper question elsewhere in the comments. I think you’re right – the growing season would be shorter. I imagine the plants come up later, so they’re harvested later, and the colder weather would hit before they’d dried in an open air barn. I’m told these kilns were only used for about 10 days out of the year – but those would’ve been really busy days for the farmers. As Pierre noted, there are a number of cigarette plants in the local area. I don’t know if any of the tobacco grown along the Port Rowan branch was shipped on the railway. I suspect that by the 1950s it was simply trucked to Delhi. That said, kilns could also be fitted with oil heaters and a lot of tank cars of oil were shipped to Norfolk County during the curing season. I haven’t yet decided whether my S scale kilns will be fitted with wood stoves or oil heaters but there were thousands of these structures in the county at one time so I could certainly ship tank cars of heater oil to St. Williams and Port Rowan. Nicely done. I always find it hard to shift focus mentally from one scale to another. How’s your experience been? Interesting question. I have to admit HO feels “small” to me now. I used to model in it a lot, but then switched to O scale (narrow gauge, but the buildings and details were still huge) and then S. Mostly, it’s about retraining one’s mind to decide what level of detail one needs to add. Things that can be done with paint in HO need a small piece of wire or styrene in O, for example. 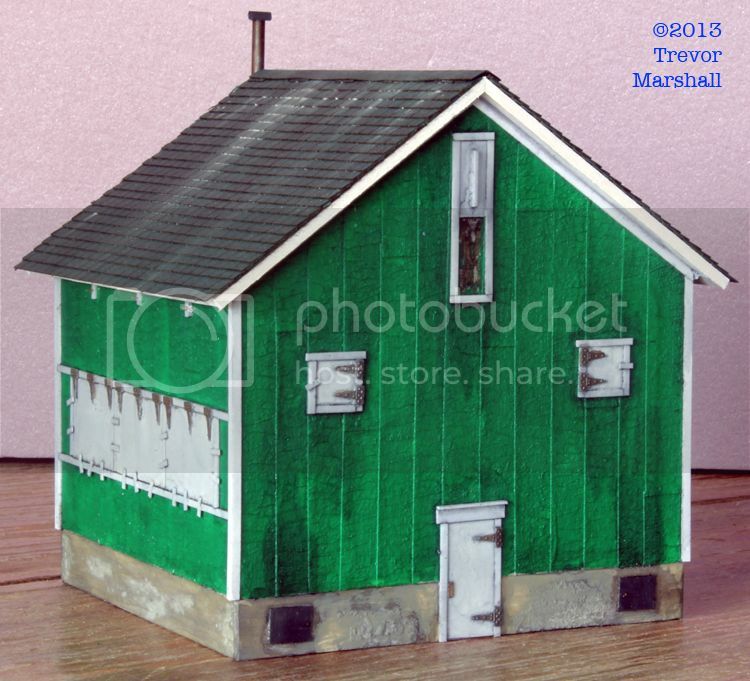 Roger Chrysler has modelled tobacco barns on his excellent Lake Erie and Northern layout. I’m curious as to how you modelled the tarpaper exterior. The tarpaper is simply masking tape. I put a strip on a piece of plate glass, measure and cut appropriate widths of tape (in this case, 24″ wide as measured on the prototype), and then apply it to a styrene wall. To make sure it doesn’t curl in the future, I run a bead of thick CA onto the wall first, then flatten the tape into it. The CA sometimes gets squeezed out on to the exterior, but can be quickly wiped off. I’ve used this technique for years and haven’t had any trouble with peeling tape. When I’m sure the CA has cured (so I don’t ruin a paint brush), I simply brush green acrylic art-store paint onto it, working in the direction of the strips. When this is dry, I go over it with a wash of stain from Hunterline. I particularly like the texture of the masking tape. Thanks for the explanation. I have used a variety of methods to simulate tarpaper, but have never been totally satisfied with the results. I should try your method of bonding the tape with CA to the substrate. Trevor, these look great. For sometime there were kilns just like these on the north side of the 401 between Trenton and Grafton. Very distinctive buildings. The soil in that area is very sandy so it makes for great tobacco growing. I saw them often on my travels between Kingston and King City. Good point – they weren’t all in Norfolk County! When searching online for photos, I found examples throughout eastern Ontario and even up into the Ottawa Valley. Tillsonberg, Aylmer and Delhi had large cigarette plants adjacent to the CN/Wabash main line as well as cured tobacco was shipped to other plants in the country. The kiln looks better in person than in the photo. My pleasure Pierre and I agree – it does look better in person. The weathering is really harsh in the photo. Rather than using masking tape to simulate tar paper, I have been using paper bandage tape. It comes in a couple of widths and is very thin. I have used it on a number of models with great results. You don’t have to apply CA prior to installing the tape. I have used a touch of CA when the tape is applied to the edge of a roof. Good idea, Gene: Thanks for sharing it. I have to admit I like masking tape because it’s handy – I always seem to have some around, and there are three hardware stores within a five-minute walk of my house so I can always get more. Thanks Martha – not kilns of the kind you’re used to, I bet!